As I wrote in my last vacation blog post, when we returned to the Canyon Rim Visitor Center parking lot, after viewing the New River Bridge from two observation decks, it was still early morning. We discussed the possibility of checking out of our hotel a day early, as we had seen all we hoped to see during our stay in the Fayetteville, WV area. We checked the weather report and saw that we would encounter rain en route Maggie Valley, NC (our final destination). Travel on our scheduled departure day, though, looked rain free. We decided to stay the night. In the early afternoon of May 11th we drove to Beckley, WV to eat lunch at The Outback. I ordered a 6 oz. Sirloin Steak with a loaded baked potato and side salad. Bob ordered a 9 oz Sirloin Steak with a grilled lobster tail, served with broccoli and a side salad. We ordered a Bloomin’ Onion as an appetizer. Lunch was delicious and very filling. After lunch we stopped at Tamarack, which was located very near to The Outback. Tamarack features a red peaked roof and landscaped grounds that internet sources say draws hundreds of thousands of visitors each year. This large arts and crafts facility sells West Virginia craft products, such as wood, glass, textiles, pottery, metal, jewelry, as well as specialty food items, fine art, and West Virginia books and recordings. We visited only to see what was inside the building with the red peaked roof that we pass whenever traveling in this direction. The craft products, etc. were all nice, and we oohed and ahhed over a few items. Willpower stopped us from making any purchases. We stopped in Mount Hope on our way back to the hotel. Mount Hope is located on the Coal Heritage Trail. Ornate fountain and a large block of the once famous New River smokeless coal. The houses along Main Street were lovely. Mount Hope looks pretty much as it did in the early 1900’s. A man who was at a business establishment called Peggy Sue’s made a point of coming out of the bar to tell us about the gas station in town at which Hank Williams died. He said the station was blocked in by trucks now. We drove through town but didn’t see the blocked-in station to which this man referred. I did read an account of Hank Williams’ ghostly night ride, and Mount Hope is mentioned in the account. Upon returning to the Fayetteville area, we stopped at Dairy Queen for a peanut buster parfait (me) and a butterscotch dilly bar (Bob) before returning to the hotel. I kept seeing Facebook posts from family and friends in Pennsylvania who wrote about rain and thunderstorms. Up to this point we had been experiencing beautiful weather on vacation, not one drop of rain. Our luck was about to run out. All was good, though, because we were in for rest of the afternoon and evening. We even ate dinner in our hotel room. Dinner was light, after the hearty lunch we ate earlier in the day. We ate a picnic lunch – chicken salad with crackers, pineapple and cookies. According to the weather report, we will probably travel in rain for a short time on our way to North Carolina. In my next vacation blog post, we arrive at our final destination — Maggie Valley, NC. On our third day of vacation (May 11th) we were showered and dressed and had eaten breakfast by 6:30 am, at which time we left for another drive to the bottom of New River Gorge near Fayetteville WV. Yesterday morning, as we crossed over the New River Bridge en route Babcock State Park, there was fog rising up from the bottom of the gorge. I hoped conditions would be the same this morning because it would be quite impressive seeing the bridge rising out of the fog. Unfortunately, there wasn’t any fog this morning. Still, the view at the bottom was once again worth the trip! We stopped at three small waterfalls, as we were climbing up the other side. Our next stop was at the Canyon Rim Visitor Center. The views of the gorge and bridge are the main attraction at the visitor center. A short hiking trail descends into the gorge on a wooden boardwalk. The boardwalk has two observation decks which offer unobstructed views of the longest steel arch span in the western hemisphere and the mile wide gorge it spans. We walked the trail to the bottom-most observation deck. We have made this hike several times over the years. The view took on new meaning for us, as we saw where we had been when we were at the bottom of the gorge. See that bridge at the bottom of the gorge? I stood on that bridge, when we drove to the bottom of the gorge! It was not yet 8:30 am, when we walked back up the wooden boardwalk to the visitor center. We discussed the possibility of checking out of our hotel a day early, as we had seen all we hoped to see during our stay in the Fayetteville, WV area. We checked the weather report and saw that we would encounter rain en route Maggie Valley, NC (our final destination). Travel on our scheduled departure day, though, looked rain free. We decided to stay the night. In my next vacation blog post, I will share what we did on he rest of our third day of vacation. On May 10th, our second day of vacation, after visiting Babcock State Park we drove to the Summersville area, where we crossed over the Summersville Dam and entered the Gauley River National Recreation Area. We enjoyed views of the dam from the tail waters of Gauley River, as well as from an overlook on WV Route 129. The Summersville Dam is 2,280 feet long and 390 feet tall. The dam was built between 1960 and 1966 by the U.S. Army Corps of Engineers. The Summerville Dam is described as a “rock-fill dam” and is the second largest of this type in the eastern United States. It took 12 million cubic yards of dirt and rock to construct it. The reservoir formed by the dam is called Summersville Lake. It covers 2,700 acres and has 60 miles of shoreline making it the largest lake in West Virginia. Located on Rt. 129 a short distance from the Summersville Dam is an overlook of Long Point on Summersville Lake. The overlook provides a beautiful view of Long Point, which is the highest cliff on Summersville Lake. Long Point juts out of the water to almost 100 feet. We ate lunch at Dirty Ernie’s Rib Pit in Fayetteville, WV. The restaurant wasn’t much, looking at it from the parking lot. It is true that one should not judge a book by its cover. Even though the restaurant was very busy (it being Mother’s Day), we were seated in a short amount of time and served fairly quickly. 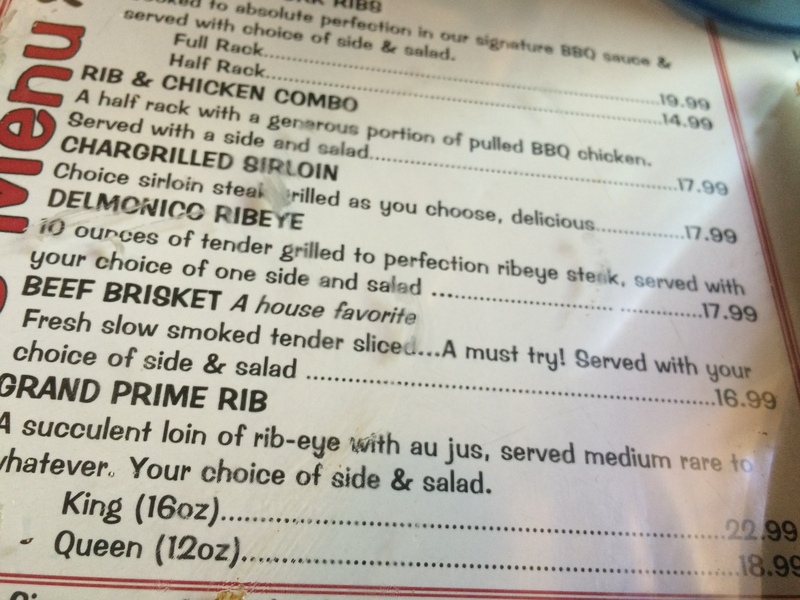 We ordered the smoked brisket entree. The brisket was very tender and delicious. By the way, we ate at Dirty Ernie’s per the suggestion of our friend Jim “Skid” Robinson. He is the author of an excellent blog, Skid and Sandy on the Road. Stay tuned. In my next vacation blog post I will take you to the bottom of New River Gorge! We visited Babcock State Park on May 10th, our second day of vacation. Located in Fayette County in south central West Virginia, Babcock State Park was easily accessible from our Oak Hill hotel by following US 19 north. At the US Rt. 60 exit we traveled east 10 miles to State Rt. 41 South. The main park entrance is 4 miles south, near Clifftop. If I had a bucket list of places I want to see, Babcock State Park would be on that list. The highlight of our visit to Babcock State Park was seeing, in person, the much-photographed grist mill located near the park’s administration building. Please click on the black square displayed below. A short video, with sound, that Bob created will play! According to the Babcock State Park website, the Glade Creek Grist Mill was completed in 1976. The mill was built as a re-creation of Cooper’s Mill, which stood on the present location. The Glade Creek Mill is a living monument to the over 500 mills which thrived in West Virginia at the turn of the century. The Glade Creek Grist Mill provides freshly ground cornmeal, which park guests may purchase. Other noteworthy stops in the park included two scenic overlooks along the road to the Manns Creek Picnic Area, Boley Lake and hiking the Island in the Sky trail. We had hoped to enjoy a scenic overlook of Glade Creek on the Island in the Sky trail. Unfortunately, the creek was not visible because there were trees in every direction. I will be sharing more of vacation day 2 in my next blog post about our West Virginia and North Carolina vacation. Our 9-day North Carolina vacation began on Sunday, May 11. We traveled in separate vehicles. Bob rode the motorcycle, and I traveled by car. The amount of traveling planned for our vacation was more than I could do on the back of a motorcycle. Our first day of vacation was a traveling day. We left home (Warren, PA) around 7:00 am. We were not sure how far we would get, so we didn’t make a hotel reservation for our first night’s lodging. It was a good traveling day. It started out chilly but warmed up the farther south we traveled. Bob shed his leather chaps in Waynesburg PA, after about 3 ½ hours of travel. When we left Warren, it was sunny. It clouded up around Tidioute PA and stayed cloudy into the Pittsburgh PA area. It looked like rain might have been on the way, but it didn’t rain on us. The sun did come out again soon after leaving behind the Pittsburgh area; the sun stayed with us for rest of the day. We made several stops along the way. We made three fuel stops: one in Franklin PA, where Bob filled up; one in Waynesburg PA, where we both fueled up; and a third stop in Sutton WV, where Bob filled up. I wrote that we “both fueled up” in Waynesburg. I filled up; Bob didn’t. The gas pump that I used ran normally, whereas the gas pump that Bob chose ran slowly. In the amount of time it took me to fill up my car, Bob didn’t even get 3 gallons into his motorcycle gas tank. The third fuel stop was because Bob didn’t fill up his gas tank in Waynesburg. In addition to fuel stops, we stopped for lunch at a rest area in West Virginia along Interstate 79 and made two photo stops. Bob took this “selfie” at the rest area, after we had eaten lunch. Our picnic lunch included Bumble Bee tuna salad with crackers (ready to eat), no-sugar added diced peaches and a sugar free chocolate chip cookie. We brought the makings for this picnic lunch for FIVE picnics! The two photo stops were made in West Virginia along Route 19. The first photo stop was at a scenic overlook just north of Summerville WV. A group of young men and one young lady asked Bob if they could have their picture taken on his motorcycle. He agreed, but cautioned each person to not touch the hot exhaust! After the bystanders had their turn having their picture taken on the motorcycle, I had Bob ride to a different location at the overlook where I took his picture on the motorcycle. I left my car at the first location and rode the motorcycle to my car. It was the first time I had ever ridden the motorcycle without a helmet. It was a very short ride, but it felt really odd not wearing a helmet! The second photo stop was at the Canyon Rim Visitor Center. A wooden boardwalk and a series of steps descend into the gorge. The boardwalk has two observation decks. We hiked down to the lower observation deck, which offered an unobstructed view of New River Bridge and the mile wide gorge it spans. New River Bridge is the longest steel arch span bridge in the western hemisphere. We made it as far as Oak Hill WV, arriving there around 3:00 pm. We stayed overnight at the Comfort Inn, about 5 miles south of the Canyon Rim Visitor Center. We would stay at this hotel again. The hotel was reasonably priced; our room a bit cramped but comfortable and clean. Our hotel room was on the second floor and faced the front. Our view was Route 19. We hoped that the traffic noise would not disturb our sleep; it didn’t. I would, however, ask for a room in the back if the opportunity presents itself that we stay there again. The complimentary breakfast included the basics: coffee, juice, milk, Danishes, and cold cereal but didn’t stop with those selection. A hot breakfast of eggs, sausage, biscuits, sausage gravy, make-your-own waffles, milk, fresh fruits, and yogurts was provided as well. When we left the next morning, we did not have to stop for breakfast somewhere else because this Comfort Inn provided a complete breakfast. Here is a map of our first day travels. We could have traveled a greater distance, but there was really no need to go further. Why hurry? We were on vacation!